The drone-sized aircraft developed at MIT flies thanks to the concept of "ionic wind"
A nearly silent, drone-sized aircraft has shown it can fly, thanks to a scientist who was inspired by watching "Star Trek" as a child. With neither propellers nor jets, the airplane gets its thrust by applying a strong electric field to the air. That general idea has been demonstrated at science fairs, but the new work shows it can power a free-flying airplane. So can people look forward to traveling in planes that are almost silent and emit no air pollution? "Not anytime soon," says Steven Barrett of the Massachusetts Institute of Technology, who reported the results in a study released Wednesday by the journal Nature. 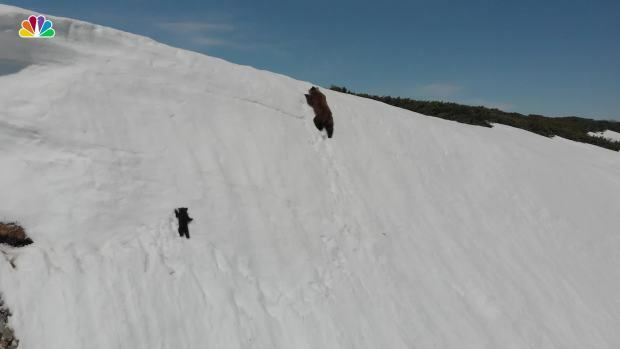 Drone footage from Russia shows a bear cub trying to follow a bear to the top of a snowy slope but the cub can't seem to make it. After sliding down the slope many times, the adorable cub perseveres and joins the grown bear atop the slope. It's not clear whether the technology could work at such a large scale, he said in a telephone interview. And even if it can, it would take a few decades to develop such planes, he said. Before that, the approach might be used in airplane-like drones that perform tasks like environmental monitoring and surveillance, he said. As drones become more common in urban skies, the lack of noise would be an advantage in making them less bothersome to people on the ground, he said. The Nature paper reports the results of 10 test flights inside an MIT athletic building. With a wingspan of about 16 feet (5 meters), the five-pound (2.45-kilogram) plane sailed along at about 11 mph (17 kph). Each flight covered about 60 yards (55 meters). Barrett, 35, said he was inspired as a child by watching "Star Trek" television episodes and movies, where he was struck by the shuttles that flew with no moving parts in their propulsion systems. He recalled thinking, "There should be a way things should fly without having propellers and (jet) turbines." As an adult, he focused on that and came across a concept called "ionic wind." For the MIT airplane, that involves a series of thin wires at the front of the plane that generate a powerful electric field. The field strips electrons from air molecules, turning the molecules into positively charged particles called ions. Those ions flow toward negatively charged parts of plane, colliding with ordinary air molecules and transferring energy to them. That produces a wind that provides thrust for the plane, Barrett explained. 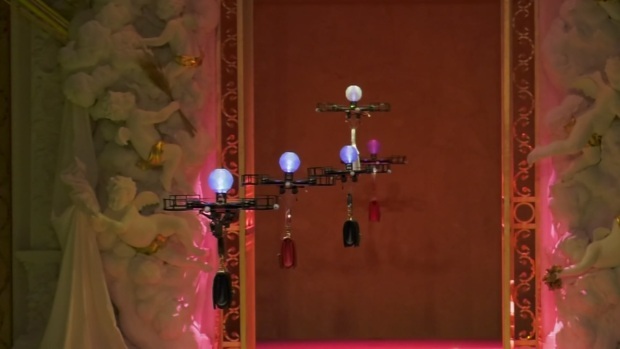 At a recent Dolce and Gabbana's fashion show in Milan, drones joined the usual models walking the runway. A similar process has long been used in outer space to propel some spacecraft, he said. Barrett said he hopes to find a way to eliminate the "very slight buzz" one can hear. "I think they're onto something here," said Pat Anderson, a professor of aerospace engineering at the Daytona Beach, Florida, campus of Embry-Riddle Aeronautical University. He had no role in the research. He called the results impressive. But the experimental aircraft lacks the range and endurance to serve as a useful drone, and it's not clear whether the technology could be scaled up to fix that or become useful for propelling a passenger plane, he said.